Deciding once and for all: Should you love or hate Bryce Harper? If you know baseball, you know Bryce Harper. Even if you don't know baseball, there's a fairly good chance you know Bryce Harper. Harper was a first-overall draft pick who has gone on to become Rookie of the Year, the youngest position player ever selected for the MLB All-Star Game and the youngest-ever unanimous National League Most Valuable Player. And he's taking it upon himself to make the tired sport of baseball fun again. Those are all incredible accomplishments, especially for a player who is still only 23 years old. But there's another side to Bryce Harper... and that side is kind of a total jerk. The Washington Nationals' outfielder was drafted into the MLB six years ago, and for a lot of people it's still difficult to determine whether we love him or hate him. So, being the generous souls we are, we decided to pull together some evidence from both sides to help you make an informed decision. In the 2010 National Junior College World Series, Harper received a suspension after being ejected twice. The suspension ended his amateur career as his team lost while he was on the bench. On May 8, 2016, Harper was seen giving a jar full of money to a homeless woman in Chicago after a four game series with the Cubs. The next day, Harper was ejected from a game in the ninth inning after arguing balls and strikes. Shortly after his ejection, the Nationals won the game on a walk-off home run, and Harper promptly returned to the field and gave a nice "f*** you" to the umpire before going to celebrate with his teammates. Harper was seen donning a 'Make Baseball Fun Again' hat after a win on Opening Day this year, supporting the feelings he revealed in an ESPN feature about baseball lacking 'flair.' Even if you don't agree with his thoughts on the game (or with Donald Trump's thoughts on anything), this was a fantastic reference and we would totally wear those hats. Bryce Harper pronounces 'meme' wrong. Bryce Harper likes to take sneaky selfies with fans. It might be nicer if he had told this fan he was there, but it's funny nonetheless. Late in the 2015 season, Harper got into a dugout fight with Nationals relief pitcher Jonathan Papelbon after Papelbon seemingly decided Harper's baserunning wasn't up to par. The altercation was clearly more Papelbon's doing than Harper's, but the lack of hustle on the field and the fact that Harper yelled back when confronted doesn't exactly get him out of this situation scot-free. Harper chose not to participate in the 2014 Home Run Derby because his father -- who pitched to him during the 2013 Derby -- was injured and unable to join him. Harper said that if he wins, he wants his dad to be there, and that's adorable. Harper is known just as much for his style off the field in addition to what he does on the field, but last October he made the decision to prematurely age himself and dye his hair grey. He left his beard its natural brown and left us all confused. Bryce Harper is all about supporting other Washington-area sports teams. Early in the 2015 season, after having an incredible game of his own and hitting three home runs, Harper immediately hightailed it over to a Washington Capitals' playoff game to root on the city's hockey team. Who doesn't love a guy who loves his town? 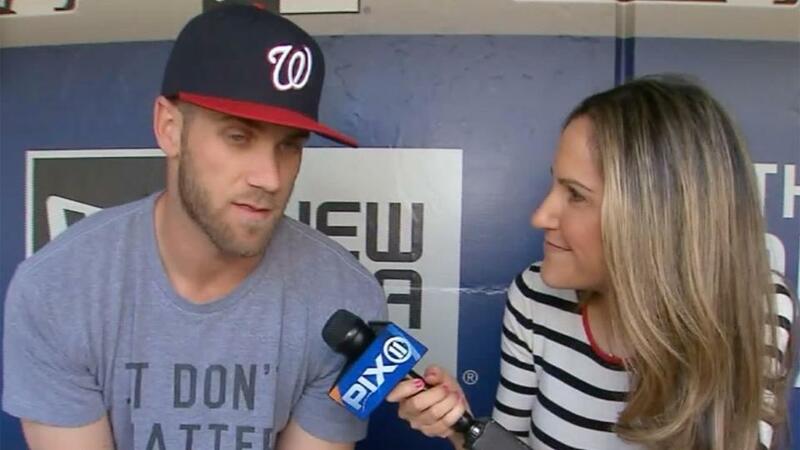 Bryce Harper CHEATS AT CATCHPHRASE. Like, A LOT. Post-game interviews are rarely easy on players, but when an underage Bryce Harper was asked what his favorite beer was, he took a moment, thought carefully about his answer, and gave us the most perfect response we could have ever hoped for: the now-infamous "That's a clown question, bro." ... Alright, maybe that didn't actually decide anything. 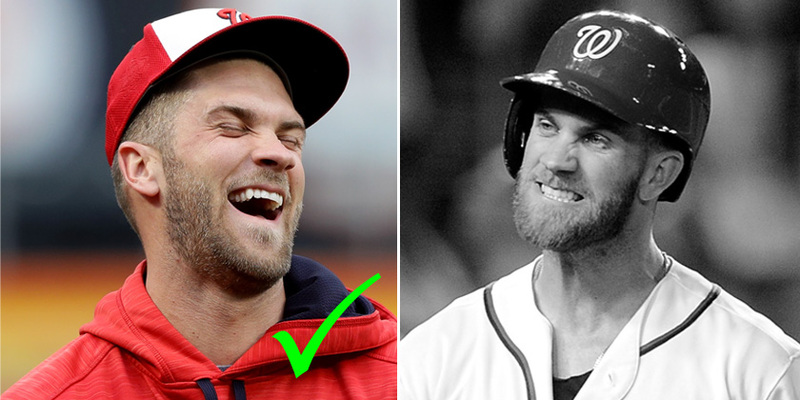 At the very least, it looks like Bryce Harper's good qualities are equalled out by the bad, and vice-versa. Thankfully, we should have at least 15 more years of Harper's antics in the MLB to help us form our opinion.